From Pitchfork: Video: U of Arizona Marching Band Covers Radiohead: "Our personal favorite piece of footage is culled from the middle of the band's performance. It begins with all 250 students chanting 'Fitter Happier', and from there kicks into a booming, brassy 'Optimistic'. This rolls straight into 'The National Anthem', which features a couple of impressive, range-pushing trumpet solos." My alma mater's marching band covers my favorite band. 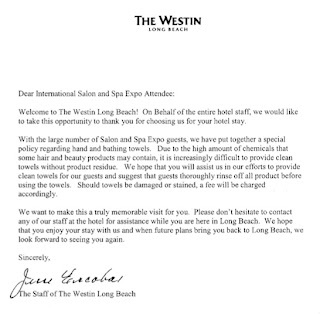 Salon Expo Attendees: Keep Your Chemicals Off Our Towels! Last month I stayed at the Westin in Long Bench while on a businesses trip. I happened to be there at the same time as the International Salon and Spa Expo. "With the large number of Salon and Spa Expo guests, we have put together a special policy regarding hand and bathing towels. 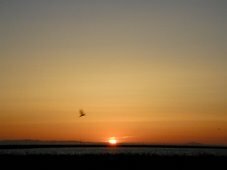 Due to the high amount of chemicals some hair and beauty products may contain, it is increasingly difficult to provide clean towels without product residue. We hope that you will assist us in our efforts to provide clean towels for our guests and suggest that guests throughly rinse off all product before using the towels. Should towels be damaged our stained, a fee will be charged accordingly." Scary article on the Chinese government's attacks on our military's computer networks: FCW.com - Cyber officials: Chinese hackers attack 'anything and everything': "Attacks coming from China, probably with government support, far outstrip other attackers in terms of volume, proficiency and sophistication, said a senior Netwarcom official, who spoke to reporters on background Feb 12. The conflict has reached the level of a campaign-style, force-on-force engagement, he said."